Having no actual comic shops in this city it took a little longer than most for me to realise that Wizard Magazine is no more. Sure it was never a source of consistently hard hitting journalism, but it was good for the odd chuckle and an awesome preview or two. Here Wizard retailed for around $14, meaning I could grab four comics or an issue of a magazine designed to try and get you to buy more comics, albeit with a slightly Marvel based slant. The tool that made that ratio work in their favour? The cover art. Top artists doing their signature characters or characters you may never have seen them touch. Material like that you just can't walk past. Not only does Psylocke push spotlight hoggers Storm and Jean to the 'fold around' side, I think of this image as the definitive Rouge shot. That kiss on the robot's skull - flawless. 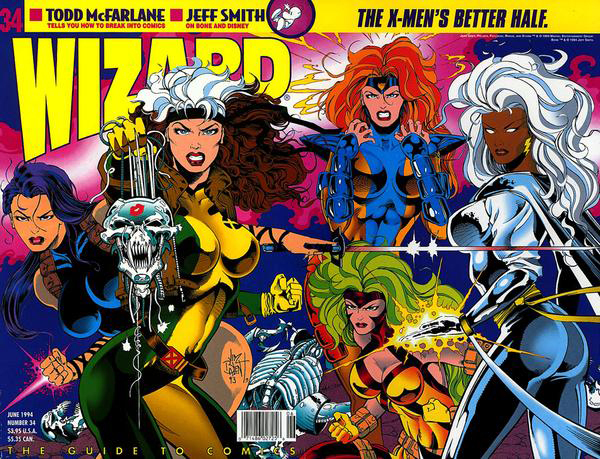 What is your favourite memory of Wizard Magazine? Jim Balent is a great artist but he was so very exceptional about his style when it came to drawing women. i still think i have my Catwoman door poster. ya all know which one i'm talking about i hope? 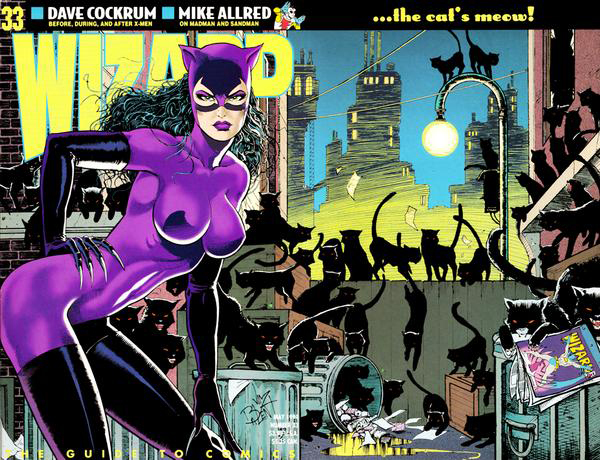 When that Wizard cover of Catwoman came out, I cut it off and wrapped my sketchbook with it. More people asked me to read my comics from seeing that image wrapped around that book, than anything I've known, including The Dark Knight. I'm kind of partial to the X-ladies myself. Those are the costumes I remember the best. My first official title as a comics collector and from the era when I started collecting. I know they all have great big '80's hair (something I really wasn't a fan of even back in the '80's), but they're still my girls. hey guys, if its Jim Balent drawing women it's all good.